Here’s a sight you may not expect at a kabuki performance: A blue-haired boy bolts toward a massive snake that writhes menacingly on stage. He brings his sword down on the beast, slicing it into sections that fall apart dramatically. I thought a kabuki performance would’ve been a bit less extravagant, but actor Nakamura Hayato says a scene like this isn’t entirely out of place. Still, it’s safe to say that “Naruto” isn’t what comes to mind when you think of kabuki, just like Hayato, 24, and Minosuke, 28, aren’t your stereotypical kabuki actors. Both come from kabuki families, but when they walk into a press conference at Shinjuku Mura Studio, they maintain the confident air of seasoned rock stars, Minosuke in particular. His hair is bleached blond like 1980s rocker Billy Idol and Hayato, well, he also resembles an idol — specifically the kind that might appear in teen heartthrob magazines like ViVi or Myojo. The “Naruto” kabuki focuses on the backstory: Naruto grows up in a ninja academy alongside Sasuke, who has dedicated his life to exacting revenge for the murder of his family. The village the academy is in, Konoha, was once threatened by a powerful fox known as Nine-Tails. It is later revealed to Naruto that the spirit of the fox has been sealed inside him, making him simultaneously powerful and vulnerable. Although Naruto and Sasuke appear to be constantly at odds, their friendship is as undeniable as their rivalry. Fans of the manga will be relieved to know that the kabuki’s adaptation is faithful to the narrative laid out over Kishimoto’s 72 volumes. 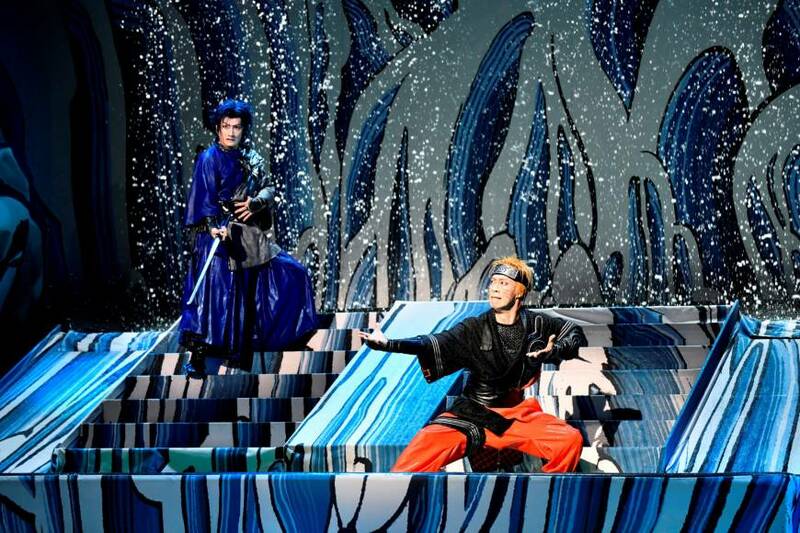 For Minosuke and Hayato, who are part of the generation of children who grew up reading the adventures of Naruto and Sasuke, the question was how to infuse the story they knew so well with the highly stylized art of kabuki. “I think if a kabuki actor is acting in a role, he’ll naturally deliver certain lines he wants to emphasize in a way that gives it that sense of kabuki,” Minsouke says. Hayato says he has heard of that idea before, and that even when it’s a performance in which the actor is instructed to speak in a more modern way, it’s still not going to be a straight performance.